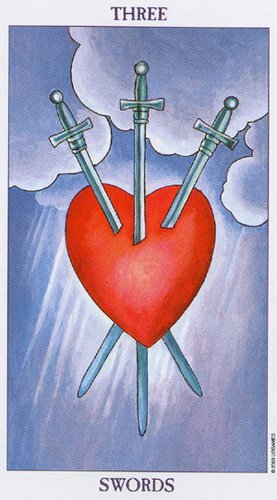 The imagery on the Rider Waite Smith card shows a heart impaled by three swords. Sharp as they enter the heart, and blunt as they exit. The suit of Swords refers to the realm of thought, or the intellectual realm. We have all experienced how our sharp reasoning abilities can become dulled and blunt when we allow our emotions to dictate our thoughts, particularly if we become obsessively emotional about something. The 3 swords impaling the heart has been interpreted by many other tarotists to mean a love triangle. Today I’d like to play with that interpretation a little. Once upon a time there was a king with three daughters. They were all beautiful, but by far the most beautiful was the youngest, Psyche. She was so beautiful that people began to neglect the worship of Venus, the goddess of love and beauty. Venus became very jealous of this girl who was a mere mortal, and asked her son Cupid to make Psyche fall in love with a horrible monster. When he saw how beautiful she was however, Cupid dropped the arrow meant for Psyche and pricked himself with one of his own arrows instead, thus he fell in love with her. After many trials and tribulations, and much heartache, much of which was metered out by the angry and vengeful Venus upon Psyche, the tale ends with Cupid and Psyche marrying and Psyche becoming a Goddess herself. Venus thus eventually accepts their union as the admiration of mortals is no longer drawn away from her by another mere mortal. In this tale we see the destructive elements of this love-triangle when Venus can no longer reason without her emotions getting in the way. We see how jealousy and anger blunted the sharp reasoning abilities of the Goddess Venus, and how her desire for revenge on the beautiful Psyche results in the one she loves, her son Cupid, falling in love with her nemesis, Venus’ revenge resulting in heartache for him as much as for Psyche. We see how Venus’ love for Cupid and her loathing of his lover Psyche, are closely interwoven, reminding us that there is a fine line between love and hate. We are reminded that the heart is a universal symbol that renders us all equally vulnerable. No-one is immune to it. Even the cold-blooded and seemingly indestructible cannot escape this vulnerability. It is no co-incidence for example that the one way to slay a vampire is by driving a steak through its heart. Everyone is vulnerable to love. Love however cannot be experienced without allowing our vulnerabilities to be exposed to one another. Therefore, nobody is immune to heartache and disappointment either. We would do well to consider how our thought and reasoning processes can be dulled and blunted when we allow our emotions to overrule our common sense, or when we act out of vengeance from a place of hurt, as we often lack control of our thoughts that are no longer sharp in such situations. Thank you, Rootweaver. Good story about Cupid, Psyche and Venus. Interesting, I like your take and the stories you use to illustrate it. Just to add a thought, I find this card intensely spiritual. When, except with thought and heart collide does the person feel more in touch with the divine. What except unbearable sorrow so makes us cry out to heaven? I think it's so valuable to examine these "difficult" cards and our reactions to them. Thank you for the great post!